If you prefer to ride on your own, with our SmartGuides, you can enjoy our great routes on a pre-loaded SmartPhone. While our signature private guided tours will take you to places off our self guided e-bike routes around Sintra and feature our engaging local tour guides, you may prefer to explore on your own. If Self Guided is your thing, you can simply download our free Android or iPhone routes and hop on a Park E Bike to get rolling along Sintra's back roads. 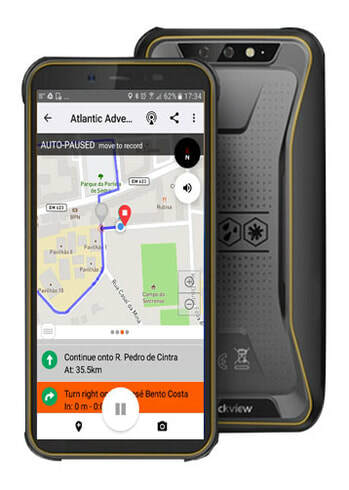 Our full featured guides include hands-free Touchscreen navigation, Interactive Route Map with Points of Interest and Spoken Turn by Turn directions. For a small additional fee, we can provide you with a pre-loaded rugged smartphone for your bike, ready to ride! If you already use the popular navigation app Komoot, you can easily access our free routes to enjoy easy to follow, spoken turn by turn directions on all our routes.